A lot of people tend to frown upon the concept of a pizza without real cheese, but remember the most important part of a pizza is never the topping. If you have a good crust and a good sauce, you can only move forward. For a quality pizza make sure you’re using some seriously high quality tomatoes. In fact, a marinara pizza with nothing more than a superb tomato base with some garlic and olive oil is a good place for any pizza fan to start. Once you realise how amazing a pizza can be with so little on top, you’ll understand why it’s perfectly possible to have a delicious vegan pizza. Cheese is only one of 12,733,028 possible pizza toppings, so really it’s a bit limiting to insist on the same thing over and over. Try something new! The trick to any pizza, beyond the sauce, is to choose simple toppings. Avoid the heaps and heaps of veggies and instead opt for just two or 3. Try things you’d never consider on pizza. 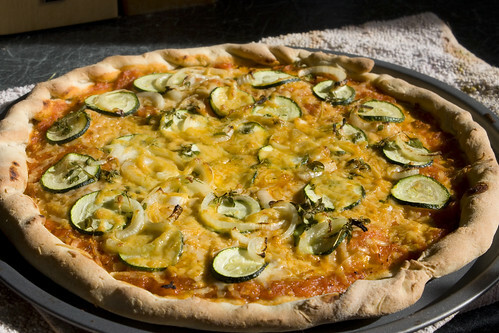 Courgette/zucchini, for instance, is a fantastic pizza topping. How about thinly sliced aubergine/eggplant with a few drops of liquid smoke? Corn and pepper? Why not? You could also try thinking way outside the box and try a mashed potato and sausage pizza. I like to add vegan cheeses to pizzas, but again that’s not always necessary. If you’ve got that base right, the possibilities are endless, and suddenly the cheese (whether dairy or vegan) becomes a possibility rather than a necessity.